My project reconsiders this phenomenon in Keith’s artwork through three facets. The first is how this process of adopting paintings for woodblock printing, or their production and (re)production, were not unilateral, but rather a result of negotiation between Keith, the publisher Watanabe Shōzaburō, and his Shin hanga (New Print) coterie making works for a Western market. The second is how Keith’s depictions became more focused on the exotic as they were transformed from painting to woodblock print; in my argument, these prints concentrated on female subjects, idyllic tranquility, and the mystical at the expense of historical accuracy. How these processes ultimately resulted in depicting Korea as a peaceful but static land, located outside of the streams of industrialization, comprises the third part of my analysis. 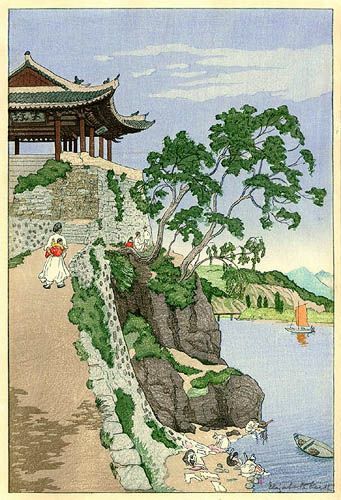 Thus, I propose these prints offered an alternative romantic vision of Korea as outside the diachronic struggles of global capitalist modernity.